Marketers are excited by the idea that they can get maximum reach with minimal cost by producing a viral video. In other words, a video which becomes so popular that viewers will forward it to their friends, who will forward it to their friends, and so on. Before you know it, you've scored one million, ten million, a hundred million views, and your product or service is selling like hotcakes. In practice, there is no magic formula for success. First, because of the subtlety involved in its production. The aim is to create a "wow" moment so that the audience watches the clip in full length, maybe watches it again, then clicks "share" to alert their friends. But what you think strikes just the right tone to prompt viewers to share the clip, might unintentionally offend or upset them. Even if the majority of viewers like it and forward it, you are not likely to get universally great reviews. Be prepared for criticism. Second, because – even if you have produced a potential hit – you still have to work hard to get it in front of the right target audience. If your target market doesn’t know about it, it can't share it. Don't think you can just upload it to YouTube and 24 hours later the sales start rolling in. Third, while 'viral' is the current buzzword, seeing a video spreading like wildfire is actually more like, well, a wildfire: out of control. Once it's out there, it's very hard to rein in. Just because you delete an offending clip off YouTube doesn't mean that that's the end of the story (arguably, you could be making things worse). Are you sure you're ready for that? Fourth, a viral video – as you're about to read – requires originality. While many marketers say they welcome this, in reality the desire to stick to core branding and messaging remains. Now, no one is suggesting you should sacrifice your brand equity, but you must be aware that there are opposing forces at work here: the need to break out of the norm, think outside the box and try something new and original, versus the desire to stick to key messages and brand-consistent colours and fonts (not to mention the desire not to upset the boss, if it doesn't work the way you want it to). Who is speaking – this could be a media celebrity or a famous actor. But this doesn't have to be the case. Perhaps it is an in-house expert or just someone in your office with a great sense of humour, or who looks and/or speaks in a quirky way. Whoever you choose, they must be remarkable, or memorable. Unless your boss is Jack Welch or Donald Trump, a video where the most remarkable feature is your CEO is unlikely to go viral. Sorry. What are they saying – remember, the idea is to create a "wow" moment in the minds of your viewers. Is the information you have to share so impactful that it does this? Where are they saying it – recording an interview in a boardroom, or with the sort of backdrops you see on television (with the guest sitting on a couch in front of a painting or standing light) is not likely to excite viewers as much as, say, a piece-to-camera by your presenter as he/she is abseiling down the side of Marina Bay Sands. How are they saying it – arguably, this is the most important ingredient. This is where humour and entertainment come in. The most credible or well-known presenter, delivering powerful content in an eye-catching location, falls flat if they don't deliver their lines in an impactful, memorable way. Or, if your viral video does not have dialogue, the selection of music and how the video is edited is about as important as what you filmed. Cost – fact is, producing a video is not free. YouTube might be free, but that doesn't mean the production will be. Be prepared to spend money. Risk – there is no guarantee the money you spend will deliver the desired results. Some marketers try to mitigate this risk by piling in sales messages, just to be sure the audience gets it. But, unfortunately, dilutes the viral element of the video in the process. Again, there is no magic formula. If there was, everyone would be doing it. And (to paraphrase Buddy Pine from The Incredibles), when every video is viral, none is. Lifespan – like any wildfire, even a wildly popular viral video (think the Old Spice series) burns itself out. A campaign might last you a few weeks or months. Next year, you'll have to come up with something new. If you still want to produce a viral video – congratulations! You are clearly ahead of the pack. You deserve praise for courage and innovation. Not every one of your ideas for a viral video will fire. But you are giving yourself the best chance that they will. Every superhero has a sidekick. And for the everyday hero in the office, that sidekick is Fuji Xerox. Fuji Xerox had already produced a series of case studies, where customers appear on-camera giving candid, credible testimonials. These are used to educate prospects about their Managed Print Services, LogMeIn real time remote assistance and Document Management solutions. But how could they attract more prospects in the first place? As every marketer knows, you must first raise awareness before you attempt to educate your target market about your product or service. 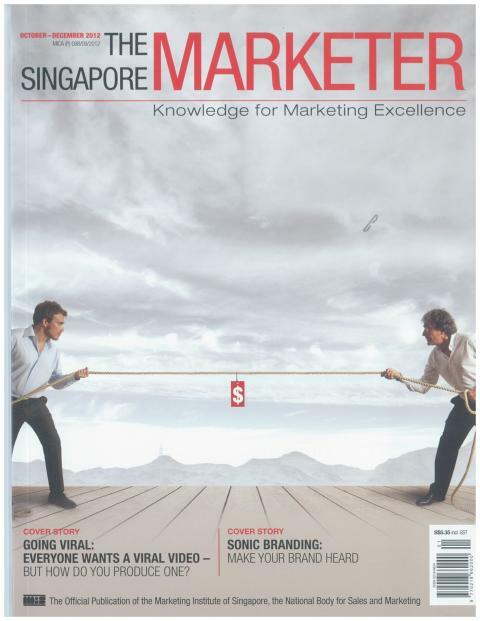 Cassandra Ong, Marketing Manager at Fuji Xerox Global Services in Singapore didn't want the usual run-of-the-mill marketing videos. She was game for new ideas, and in the end settled on a superheroes theme. The aim was to have ordinary office staff complete ordinary office tasks that viewers can relate to – except all the staff were wearing superhero outfits. Once again, the aim was to link emotionally to viewers' perceptions of their roles in their offices. Fact is, most people who work in an office – from clerks to senior management – take pride in their work and like to be seen as important contributors to the team. But many viewers can relate to the frustrations of inefficient processes, and know how much more productive they could be, if only they had the right tools at their disposal. To save costs and get internal buy-in, Ms Ong enlisted staff to act out the roles. So, while no celebrities were engaged, and the venue where the recording took place was not extraordinary, the way in which the key product messages were delivered stood out. Ms Ong also took a strategic view of circulating the video on YouTube. First, it was launched internally with a half-day event in the office, with some staff donning their costumes once more to reprise their roles as superheroes. Within 48 hours, the video had received more than a thousand hits, and the Facebook page (www.facebook.com/FujiXeroxSingapore) had been liked 346 times. Next, an eDM was sent to its database of customers, promoting a photo caption contest offering a Galaxy Tab II as the prize. The eDM directed viewers to a specially-created website www.fxdocuworld.com, to help capture leads generated by the video.